Exhibition catalogue, Four Artists of the Americas: Burle-Marx, Calder, Pelaez, Tamayo, Washington, D.C., Pan American Union, 1957, (illustrated). Washington, D.C., Pan American Union, Four Artists of the Americas: Burle-Marx, Caldr, Pelaez, Tamayo, 1957. An airy gouache on paper, Un jardín, 1945, presents us with yet another delightful glimpse into Amelia Peláez's backyard paradise in La Víbora, a middle-class suburb on the outskirts of Havana. The artist spent a lot of time tending her garden where she also raised birds and one suspects that she relished both its beauty and privacy. Although modest in size, the plants and flowers grown here adorn some of the most monumental modern still lives ever painted in Latin America. At thirty-eight years of age in 1934, Peláez returned to Cuba from her studies in Paris and spent the remainder of life in her familial home where, with quiet determination, she determined the course of Cuban modernism. 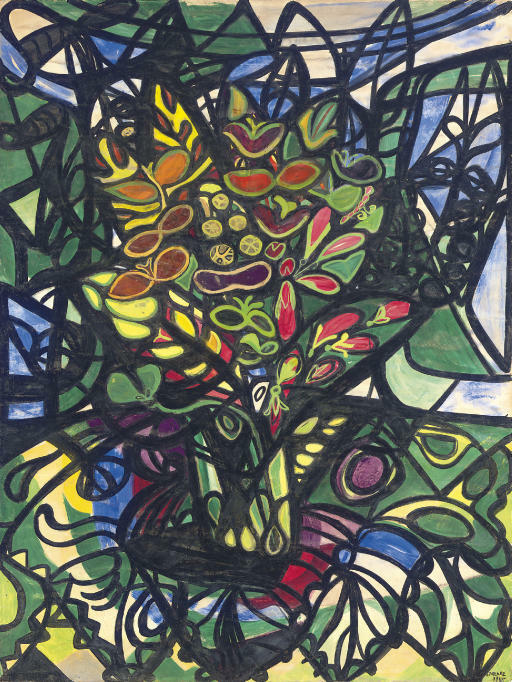 By the mid-1940s the artist had developed her signature style, which was the bold application of bright, jewel-like color embedded like cloisonné within a network of black lines of varying thickness. By this simple means she was able to portray the three-dimensionality of architectural spaces, as well as the objects contained within them, on an otherwise flat surface inspired by Picasso, Matisse and the School of Paris. Elegant arabesques dance across her works nimbly describing rattan furniture, lace doilies, ironwork grills, the stained glass patterns in fanlights, and a variety of local foodstuffs proudly piled onto plates. For it was the distinctive and homey quality of Cuban domestic life that Peláez celebrated in her oeuvre, a theme she elevated as being the true signifier of Cuban identity. Gouache was a medium that suited the subject of Un jardín particularly well, for its translucency set against the white of the paper enabled Peláez to capture the freshness and light of the tropical outdoors. The energetic curves that define leaf and flower seem to express the exuberance of natural growth while the glowing blues, greens and reds sing a paean to the joy of earthly life. Recent photographs of this garden demonstrate that the tall red flowers pictured in Un jardín still grow, as if pleasing the spirit of their most ardent admirer who was too enraptured to have ever really left.